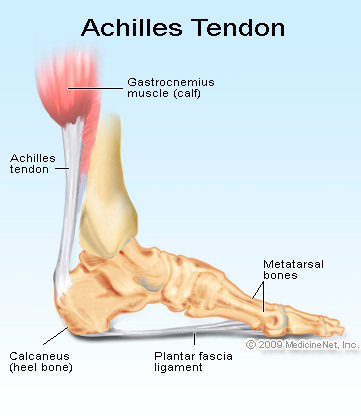 Plantar fasciitis most commonly occurs in people between 40 and 60 years of age. Plantar fasciitis can occur alone from injury or may be related to underlying diseases that cause arthritis (inflammation of the joints) such as reactive arthritis(formerly called Reiter's disease), ankylosing spondylitis, and diffuse idiopathic skeletal hyperostosis. Sometimes plantar fasciitis occurs for unknown reasons. Symptoms of plantar fasciitis include pain and tenderness of the bottom (sole) of the foot. This can lead to difficulty in weight-bearing on the involved foot, making it difficult to walk, especially the first steps after awakening fromsleep. The pain is burning, often sharp, and can be severe. Plantar fasciitis is sometimes also associated with warmth and swelling of the bottom of the foot. The symptoms may come on gradually or appear following an athletic activity. Plantar fasciitis is treated by measures that decrease the associated inflammation and help avoid re-injury. Local ice applications can be used to reduce pain, swelling, and inflammation. Antiinflammatory medications such as ibuprofen or injections of cortisone are often helpful. Orthotic devices or shoe inserts are used to take pressure off plantar spurs (donut-shaped insert), and heel lifts can reduce stress on the Achilles tendon to relieve painful spurs at the back of the heel. Similarly, sportsrunning shoes with their soft, cushioned soles can be helpful in reducing irritation of inflamed tissues from both plantar fasciitis and heel spurs. Stressful athletic activities should be avoided. Physical therapy is sometimes used as an additional treatment. Infrequently, surgery is performed on chronically inflamed spurs.